■ FREE PLAN:- Matchstick Jewellery Chest - download your plan (1726p) below. ■ A New Range of small model flying planes. ■ The Matchmaker Kits have been increased to include a Old Car and a Ferris Wheel these are excellent kits for the advanced match modeller. 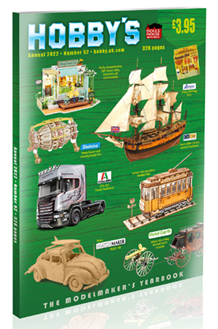 ■ For those of you interested in Marquetry Kits, these have been increased by five with a larger size of 330 x 238mm. ■ We have also widened our range of UGEARS Mechanical Models. ■ A New Range of DIY Miniature rooms, which are great little rooms for you to piece together, decorate and collect. selection of quality products we are proud to bring you every year. Just Ask Hobby's Annual is now available at leading newsagents throughout the UK. An initiative called Just Ask! has been launched to help you order your favourite magazines. The scheme aims to raise awareness of how newsagents can stock, order and in some cases even deliver magazines to your home.